When Mussolini had the Salone Delle Fontane building erected, he surely would have never imagined what people would use it for almost a century later. Built in the 1930s in a district of Rome called EUR—acronym for Esposizione Universale Roma—the building was meant to represent fascist power for a Universal Exhibition that never took place. But to ring in 2017, this majestic piece of architecture was hosting Cosmo: a music festival that defiantly spread love and empathy with electronic music. It’s all stark straight lines and huge spaces framed in white marble, and for one night it housed over 13,000 people and some of the best names of techno. Massive columns held the high ceilings in the two main spaces, with snow white drapery on the windows blocking the passage of time, while red and blue laser crossed the whole room skimming over the dancer’s heads, as the DJs’ names flickered on the big screens above their heads. From 9PM to 6AM, dancers got on with it in the Eternal City. 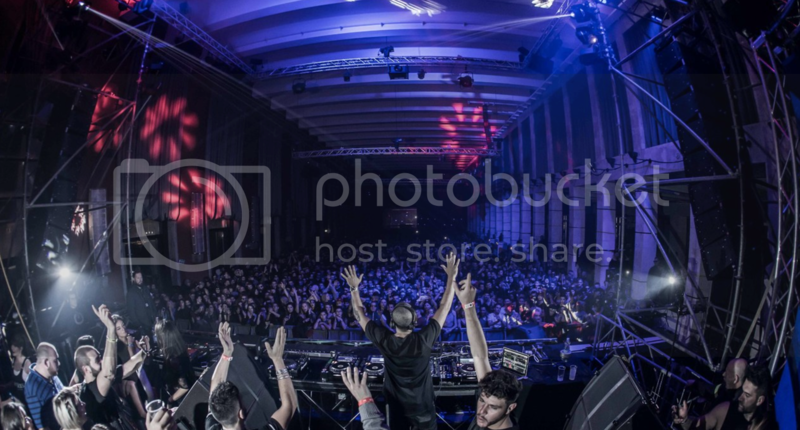 I greeted the New Year dancing to Chris Liebing’s set in the room Spazio Novecento. Although there was no countdown, people knew it was midnight. The room filled with lights coming from thousands of phones, and the front row pulled out a banner reading: “My year starts with Liebing.” Confetti and smoke on the drop rang in 2017 to the notes of Slam’s latest banger “Clap Your Hands” while the mostly Roman crowd, with their keen sensibilities and their unique accents of dragged vowels and soft consonants, shouted their wishes to each other. Outside in the street, firecrackers popped and fizzed, as is the custom in Italy, while fireworks rung out above the Square Colosseum a few hundred meters away. Meanwhile, Loco Dice was keeping his promise to go hard in the main room. He introduced Rome to the new year with a mix of Black Eyed Peas “Rock That Body” and Basement Jaxx’s “Fly Life”. He carried on with tunes like Margo Mango’s “Sauvez Willy” and “Blanket Me” DJ Cosmo Feat. Cory Friesenhan, working in the '90s rave vibe. It was a shame the two venues were five minutes away from each other, and had people walking in the streets to get there, with little or no security at all. Everyone was confused at first as there are no signs or maps around. And it was pretty chilly too, as most everyone's coats were locked in the cloak rooms. 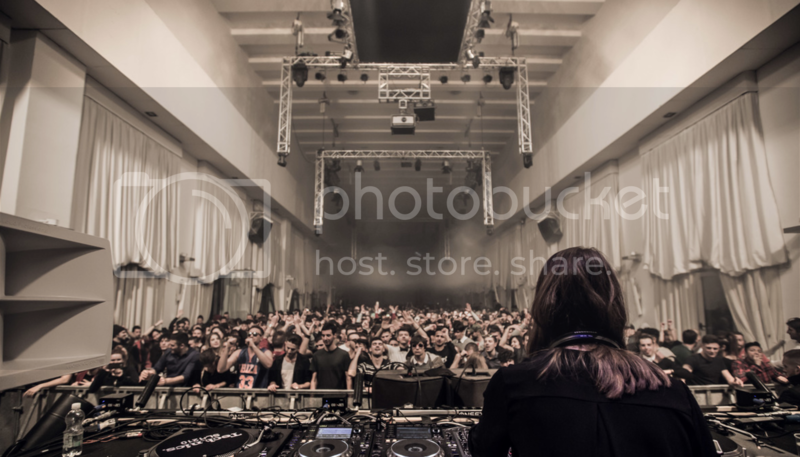 Back to Spazio Novecento, it was the turn of two female DJs on the lineup: Nina Kraviz and Avalon Emerson. While the Russian is a well-established presence in Italy, Avalon Emerson has been playing here more frequently in the past months. She established a sensual vibe alternating jazzy vocals to crackling techno, and playing her own records like “Dystopian Daddy”. Downstairs, Âme’s Frank Wiedemann was playing in Room 26. There were no huge columns or white walls in here; it was very much like any other city club. Intimate and familiar, it seemed suitable for the very late hours we were at. The live set brought up blue, almost sacral sounds with distorted keyboards, only to explode in pounding bass. After that, Massimiliano Troiani overturned it all with his exotic collection full of trumpets and percussions with a vague chillout mark. The small venue allowed the crowd to shake hands with him, which happened continuously for the whole set amongst smiles and high fives. Ilario Alicante closed the festival in Salone delle Fontane to a tireless crowd that wanted more. When the music turned off, everyone chanted “Se non metti l’ultima noi non ce ne andiamo”: the Italian equivalent to “one-more-tune”, which seems to have a vaguely threatening tone, since it insists that if you don’t play the last one we are not going away. At 7AM the crowds spilled out to Fuoriorario, the official after party held in the nearby Atlantico. On the way, two guys shouted in Roman accent “A lo senti che caldo, a lo vedi che after!”–"feel the heat, see the after"–putting their hands up, as if they were leading the little crowd behind them. In the pitch dark concert hall we were protected from the first sun of 2017, and the DJ thankfully kept working the darker tones. Trance, hard techno and acid were occasionally mixed to more chilled tunes like “The Sun Can't Compare” by Larry Heard Presents Mr. White. Though Cosmo was hardly what you imagine when you tell your friends you are going to Rome for NYE (there was absolutely no food involved, for instance), this new festival was an ambitious, wholly impressive event, the likes of which we hope to see a lot more of in Italy.